The Windies faced Pakistan in the crucial Group B game at the Gaddafi Stadium in Lahore. It is not every day that a cricketer faces the wrath for showing sportsman spirit in a game but Courtney Walsh’s act in the 1987 World Cup game did hamper his team’s progress. Windies made it to the final of the first three World Cups but started with a close defeat against England in the 1987 edition. They faced Pakistan in a crucial Group B game at the Gaddafi Stadium in Lahore after a big 191-run win over Sri Lanka. After electing to bat first, Phil Simmons and Desmond Haynes shared a 91-run opening partnership. Haynes made only 37 off 81 balls while Simmons scored a 57-ball 50 with eight fours. Windies kept losing wickets after the opening partnership as Saleem Jaffar took three wickets of the first four to fall. Skipper Viv Richards came up with a quick-fire effort scoring 51 in only 52 balls. Imran Khan’s 4-wicket haul kept the Caribbean team to only 216/10 in 49.3 overs. The advantage kept changing in the second innings as Pakistan were under recovery at 92/2 from 28/2 before they collapsed to 110/5. Saleem Yousuf led the chase with a breezy half-century. The keeper-batsman scored a 49-ball 56 with seven boundaries. He shared a 73-run stand for the 6th wicket with skipper Imran Khan to bring down the required runs. 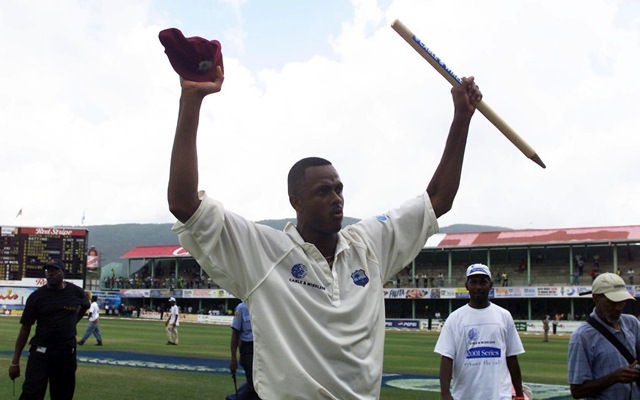 But Courtney Walsh’s 4-wicket haul reduced the hosts to 203/9 from 183/5. Walsh bowled the last over when Pakistan needed 14 runs. Abdul Qadir and Saleem Jaffar took singles on the first two balls before Qadir picked up a couple on the 3rd delivery – 10 to get from three. Spotting the mid-off inside the circle, Qadir put everything into the 4th delivery to launch a straight six and send the Lahore crowd in a frenzy. Another couple on the 5th ball brought down the equation to two runs to get off the last delivery. Walsh ran in to bowl the last ball and pulled out without delivering as the non-striker Jaffar was well out of his crease. The pacer had a chance to run out Jaffar and close the match but decided against it and settled to a warning and headed back to his run-up. Richards brought in the field for the final ball and Qadir squeezed one through to the third-man region to take his team over the line. The result did hamper Windies‘ of making it to the final four as Pakistan and England topped their Group with five and four wins respectively. Windies ended up with only three wins as they lost to England by 34 runs in the 5th match which was a virtual quarter-final for both the teams. In appreciation of Walsh’s act of sportsmanship, Pakistan’s President General Zia-ul-Haq presented an exotic carpet to the West Indian.